There were a couple of reasons that I really liked Slap Fight. The first is that I really like its neatness. Everything is very clear. Enemies are well defined, bullets are easy to see, upgrade stars stand out, the weapons are distinctive and the music and sounds are uncomplicated and supportive. Allied with this, the game is fairly slow-paced. It's scrolls continuously along, but it's not manic. It's steady and rhythmic. And although the difficulty ramps up the further you get into the game, it rarely seems unfair. Further adding to the clarity that the game exudes, it is not possible for the player's ship to crash into an enemy, nor can it impact any structure or background object. This simplicity means the player can focus purely on avoiding enemy fire. Many games in the 1980's did not achieve this simplicity and suffered from overly messy gameplay and confusing graphics. The image on the left shows a screen capture from the demo/attract mode. Slap Fight's attract mode is fairly unusual in that it demonstrates every type of weapon available. 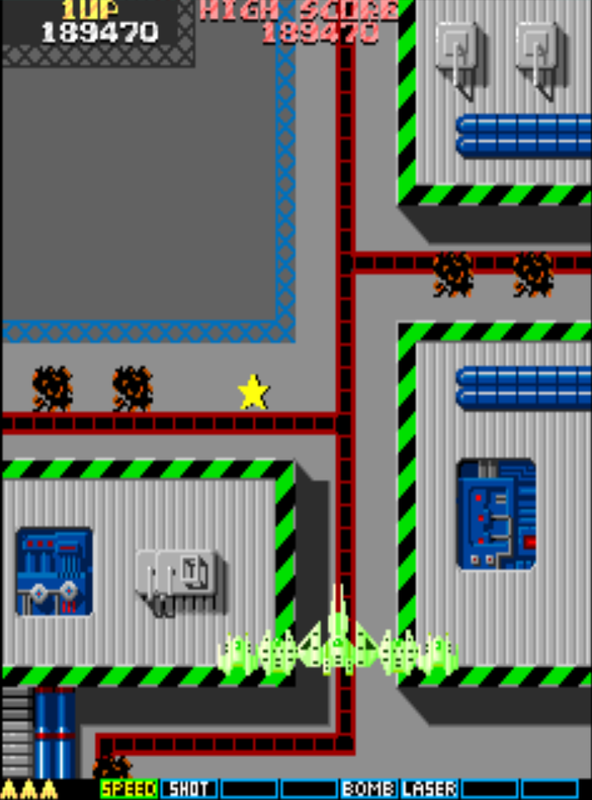 Each one is shown in sequence: 'Shot', 'Bomb', 'Laser' and 'Homing missiles', punctuated by the high score table being displayed. Throughout this review, click on any image to view it full sized. In Slap Fight, there are four Main Weapons that you can choose between and each one is represented by a graphically different ship. See below. Shot - This is your basic default weapon. 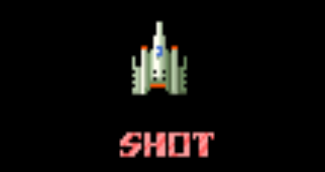 Like most shoot 'em ups, although you can just hold the fire button down, the firing rate using that method is very, very slow. So continual hammering of the fire button is required. The projectiles fired have a range of approximately half the screen height. Bomb - The bomb fires quite slowly but releases high power ordance, and covers a larger area. Laser - This narrow beam weapon fires the entire length of the screen. Homing Missile - Releases up to 16 homing missiles that hunt down targets. The projectiles are slow but can hit multiple targets simultaneously. There is no grand aim for this game, aside from slowly making your way through the various areas, seeing how far you can get and achieving your best score. There are bosses to defeat, (see below), but as far as I'm aware, the game does not have any definitive ending. It loops around indefinitely. If someone knows differently, please contact me! Because of this, it is much harder to work out how well you have done! 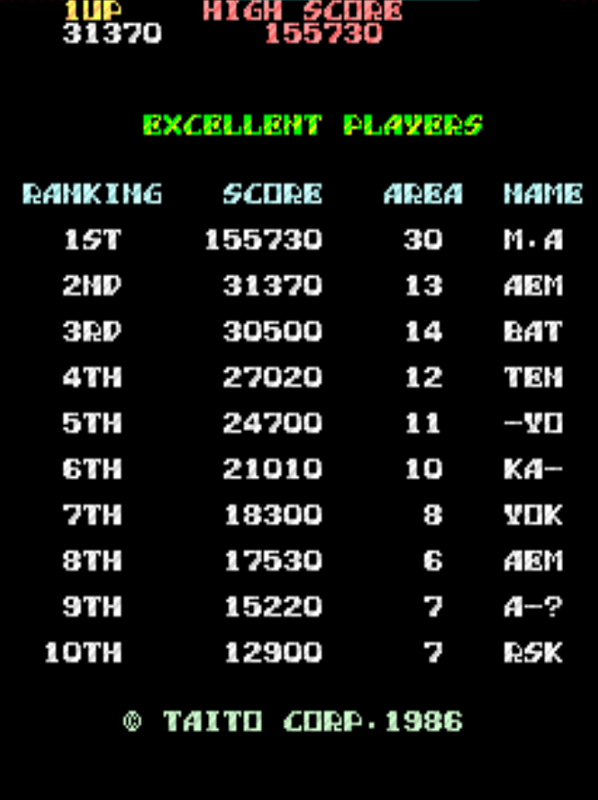 However the game does give you a summary in the high score table of the 'area' that you reached. Despite this continual scrolling, the game does still feature clearly defined 'bosses'. The background continues to scroll throughout (even when taking on the first three bosses), so this means that if you take a long time to destroy the them, enemies from the next area can start to appear onscreen at the same time as the boss. 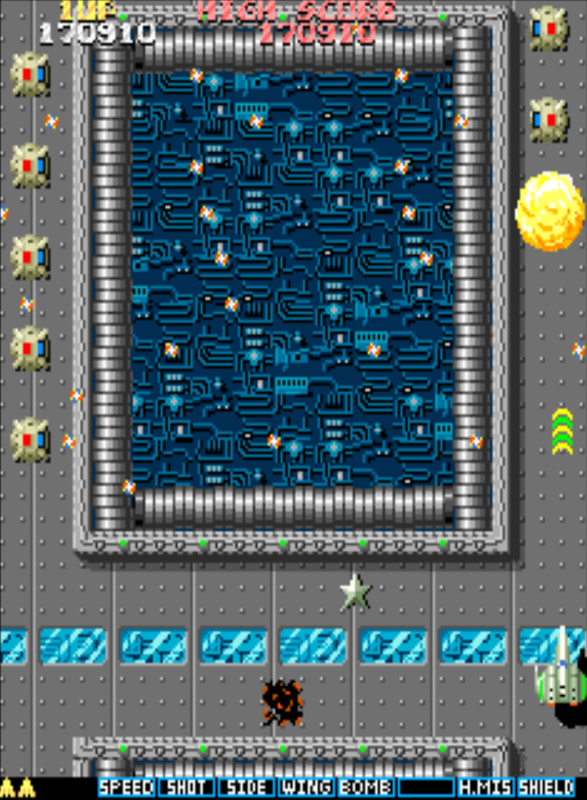 The game is rather difficult without a minimum number of power ups. So this can often mean that when you die deeper into the game, it becomes very difficult to advance further. (All power ups are lost when you die). To upgrade your ship, you must collect yellow stars that are sometimes left behind by a destroyed enemy. (I believe the enemies that drop them are always fixed, so you can learn where best to grab them). One credit ready to go - a joyous sight! Every time you pick up a yellow star, a highlight moves across a set of upgrade options which is displayed at the bottom of the screen. (See image below). The player then hits a 2nd button on the console to then make a particular selection. Some of these upgrades can be applied multiple times. When an upgrade can no longer be applied, it becomes blanked out on the selection menu. 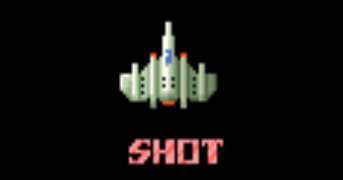 The image above shows one blanked out option ('Shot') - this is because it is currently equipped. The next section explains the various upgrades in more detail. Speed is an essential upgrade and the first one that you should apply to your ship. Without any speed upgrades, the player's ship is incredibly slow and extremely vulnerable to enemy fire. My recommendation is to apply two speed-ups at the beginning of the game (before anything else) and later add a third and fourth. You can apply a maximum of five speed upgrades to your ship. Unfortunately, it is not possible to remove a speed-up once it has been applied (unless you count dying) - so if you apply too many for comfort, you are stuck with it. I would argue that later in the game, a fast moving ship becomes more and more crucial, since enemy fire increases and the player is forced to constantly move position. 'Shot' is the basic and default weapon. If you die, your ship will always begin again with this weapon. Shot can be fired as fast as you can hit the fire button and is hence the fastest firing weapon in the game. There are times when you may want to switch back to 'shot' from a different, higher tiered weapon for precisely this reason. The firing range of Shot is fairly limited and cannot be increased. The image on the left shows you that range. The application of additional shot 'wings' only serve to increase the spread of the shot. Despite shot being the lowest tiered weapon, if you have a ship with no power ups at all and no speed, you would probably want to have this weapon above all others, due to it's speed of firing. It seems to me that there was almost an 'unwritten mantra' of rules during the 1980's when various designers were creating shoot 'em ups. Nearly all have 'shot' as their basic weapon and nearly all of them work in a very similar way to how it is utilised in Slap Fight. 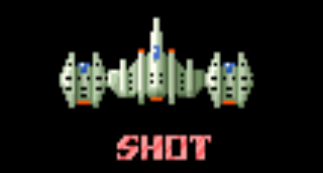 As you can see from the image above, at its default level (with no power wings applied), Shot is comprised of two small ordnance only. With each extra Shot wing equipped, additional bullets are supplied. With a single wing fitted, fire-power is doubled to four ordance (see image on immediate right). When a second wing is applied, the number of shots doubles again to eight. Finally, when the third wing is applied, a total of 10 shots are released. (See image far right). Side is a weapon that can be applied to your ship alongside any other Main Weapon. 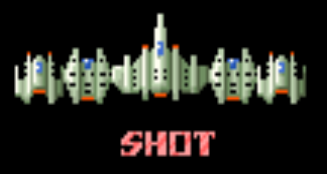 On each fire button press, a shot-type weapon eminates from the sides of the ship in a wave type pattern, reaching a good distance away. Any standard enemy caught in this wave, will be destroyed. The weapon can be fired as fast as you can hit the fire button (like the standard 'shot' weapon). In Slap Fight, enemies constantly creep onto the screen from the sides, and the quickest way of dealing with these nasties, is to shoot them using this weapon. Besides which, once installed, this weapon is constantly firing 'for free' at the same time as your Main Weapon. The usefulness and importance of 'Side' cannot be overstated. Every player should get this weapon as soon as possible, and following death, look to regain it again. 'Side' is retained on your ship even if you switch Main Weapons or lose power wings 2 & 3. Because of the way the majority of enemies move in Slap Fight, you will constantly find youself flanked on both sides. The screenshot shown on the left shows a simple example. These two enemies could be dispatched by firstly moving down to the left and shooting one and then possibly across again to the right to get the other. The problem with doing that, is that it takes quite a long time to make the move one way and then back again; and also because Slap Fight constantly scrolls, it may well be that by the time you moved for the second enemy, he would be too low on the screen to shoot. This is not good since the longer you leave any enemy, the more time he has to lay down additional fire. With the Side weapon however, this type of thing is made much easier. Just one movement up into the middle and hey presto! - both enemies immediately despatched. Once you begin to learn the movements and patterns of certain sections of the game, you can use Side to destroy enemies almost before they creep onto the screen. This is so, so useful! Note that if the player has the 'laser' weapon equipped, then the usefulenss of this weapon is greatly reduced. This is because when firing lasers, the player must hold their finger down on the fire button to release them. This greatly reduces the speed of the side weapon. (Though of course you can still choose to hammer the fire-button and use 'side' to its full potential; but then the trade-off is that your laser weapon becomes stymied. The weapon's area of effect has been increased. The speed of the weapon has been increased. (So you are causing more damage per second). Shot, Bomb and Laser all gain an Area of Effect increase with each wing application, whereas Homing Missiles gain only an increase in speed. I think it is important to understand this, since you may be forgiven for thinking that if a single bomb hits a boss (with all three wings applied) - that it would do more damage than a bomb from a ship with no wings applied. However, this is not the case. A good way to test this is against bosses. I have done so on the 1st Boss using Homing Missiles with 0 wings applied, 1 wing applied and also 2 wings applied. In all cases, seven complete rounds of missiles were required to destroy him. As mentioned, the other effect a wing has on your ship, is its size. When you apply the first wing, the size increase is modest. But for wings two and three, the increase is significant. With all three possible wings applied, the player's ship is pretty huge (not far off half the width of the screen). 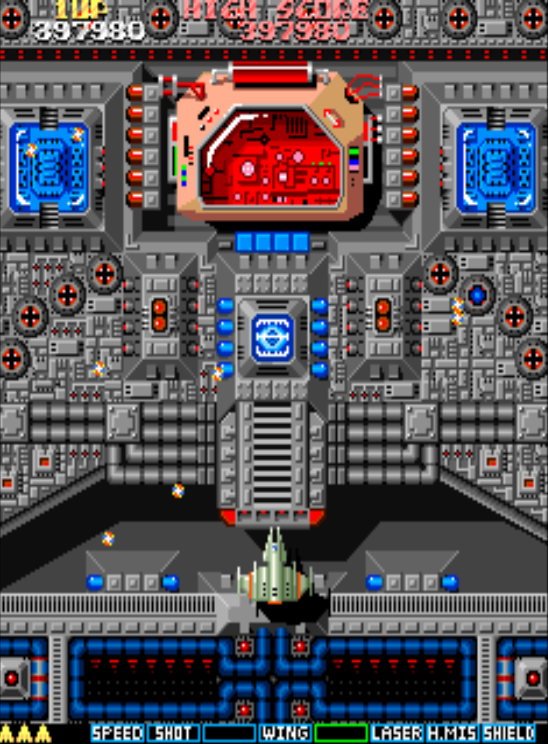 Because of this, (especially deeper into the game), it becomes very difficult to maintain a fully winged ship for any significant length of time, as there just isn't enough room to manaeover onscreen. Generally speaking, I would say that having your ship equipped with two wings is probably the best trade-off between fire-power and size, most of the time. Depending on the weapon you are switching from and to, the game has slightly different sequences that are followed. Firstly, when changing from Shot to any other weapon, a new wing flies in and is simply added over the top of your existing ship. When changing to 'shot' from any other weapon, the existing wing is simply removed by flying off the screen. It's as if the default 'shot ship' is always present underneath any other weapon wing. This particular transition is therefore slightly quicker than other weapon changes. If you swap weapons between 'bomb', 'laser' or 'homing missiles', firstly the existing wing is removed by flying off the screen (briefly revealing the 'Shot' ship underneath) - and then the new wing comes in and is applied afterwards; so this takes slightly longer to occur. In practical terms, these differences in wing application have very little impact during actual gameplay, but I mention them here out curiosity. The crucial side effects of applying wings (or changing main weapon) is discussed further in my hints/tips section. To the left: These images demonstrate what happens when you revert to 'shot' from another weapon. 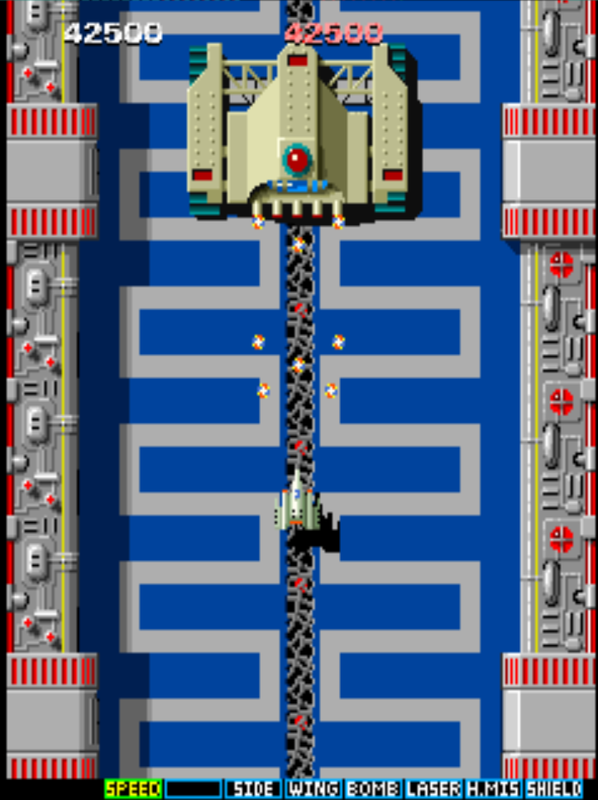 The player's ship is dragged to the middle of the screen, and the existing wing is removed, split apart and flies off into the sunset! Wings have no effect on the 'side' weapon. Nor do they change the effect of 'Shield'. Regardless of the weapon equipped, the second and third 'power wings' are all visually identical. It is worth noting that all of the player ships in the game, regardless of the weapon equipped, are exactly the same width, in every configuration. Interestingly, it does look like the height of each ship does vary very slightly, with the 'Shot' ship being very slightly shorter than the other weapons. You could argue that this might convey a tiny advantage to the player, due to the ship being very slightly smaller. Wings three and two can be destroyed by enemy fire. But wing 1 cannot be lost without the entire ship being destroyed. So aside from receiving the ship upgrade/weapon change, this is a very interesting effect which can be incredibly useful to the player. First and foremost, during this automated 'movement' phase, your ship is completely invulnerable. Enemy bullets can be passed through without any effect. So the first important thing here, is that you can use this to move to another portion of the screen 'for free' and with no fear of being destroyed. But secondly, and most importantly, the instant the auto-controlled movement is completed, flight control is returned to the player and your ship remains invulnerable for around one to two seconds! So this means you are free to move around, shoot enemies and perhaps even pass through their bullets! The advantage this provides to the player cannot be overstated; and for me it is the core gameplay element, that if used intelligently, will allow you to perform well in the game. It is possible to have a screen almost entirely full of enemies and bullets and seemingly be facing certain death, and yet changing weapon or adding a wing will enable you to survive. For this very reason, you should always be prepared to switch weapons or add a wing at moment's notice. 'Bomb' is a slow firing, high powered, wide impact weapon. When fired, the ship releases fairly short range ordnance that fall to the ground creating a fairly large colourful explosion. Any enemy that touches the explosion, is destroyed. This includes any enemy that is not directly hit by the bomb, but rather moves into it (the explosion remains onscreen for a brief time). 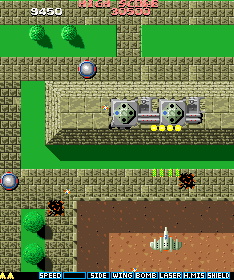 At the default level, a single bomb is released, creating one medium sized explosion. With one wing applied, the bomb radius is significantly increased - more than doubling its impact area. 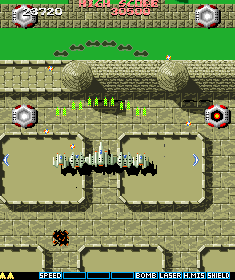 With two wings applied, three separate bombs are dropped in sequence. A single bomb (same size as for 1 wing) is dropped, but then also, two smaller bombs are dropped at a greater range. This represents a significant enhancement to the weapon. The image on the far left shows the initial bomb impact with 2 wings. You can also see in that image, two remaining bombs just ahead of it, which are about to impact the ground. The image immediately left then shows the impacts of those two secondary explosions. 'Bomb' is a great weapon and a key one to use at certain stages of the game. For example, some enemies require two normal hits to be destroyed. For these enemy types, the bomb weapon can destroy them in a single hit. For certain sections of the game, this is gives the player a critical advantage. Bomb's weakness, is that it can only destroy enemies at the point of impact. This means that the area between the player's ship and the impact points, are completely safe to enemies. An enemy within this zone is therefore invulnerable to the weapon. This can be a headache - especially with enemies that creep on from the sides of the screen, or those that are in the bottom portion of the screen (which then become impossible to hit). Despite this shortcoming however, 'Bomb' is a terrific weapon (especially with wings equipped). The wide spread of the initial explosion means that with prudent aiming you can usually destroy multiple enemies with a single hit. The image on the left is a good example of this. An enemy only has to brush the outer edge of an impact explosion in order to be destroyed. 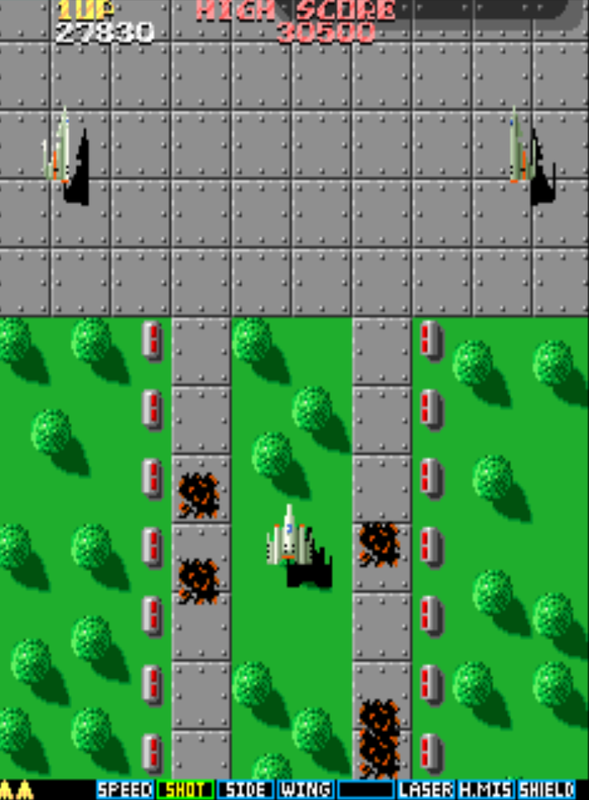 This image also shows a classic part of the game where bomb is by the far the best weapon to use, since the enemies here require two standard hits to be destroyed, and yet bomb will destroy them in a single hit. 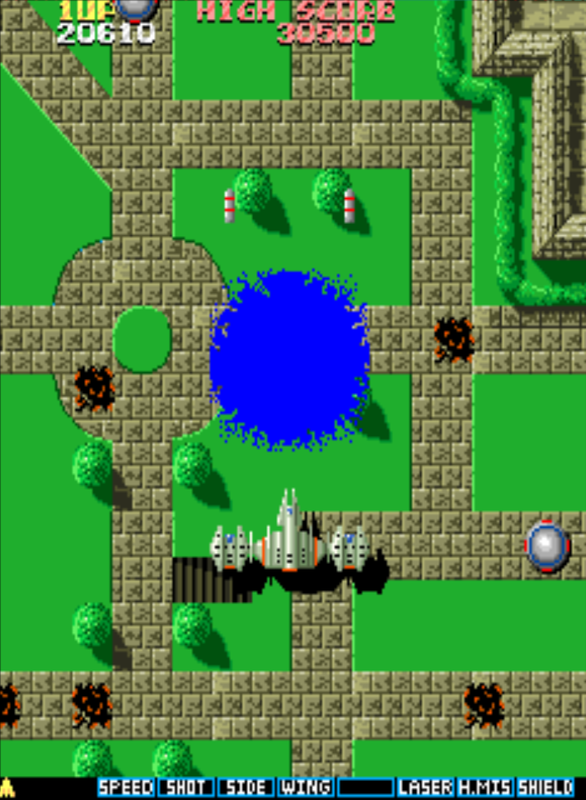 Furthermore, using bomb in the section shown above, actually destroys parts of the background structure and this causes these particular enemies to spiral off their tracks - to their doom. The right-hand image above shows the bomb weapon at full power. The initial bomb has already impacted (its size remains the same as for wings 1 & 2), but you can see that with 3 wings, the weapon provides four secondary bomblets. Laser is a long range, fairly high speed weapon that is very good for dispatching enemies the full length of the screen. Ordingarily, when it hits an enemy, the ordnance is not obliterated; instead it continues on it's journey up the screen. 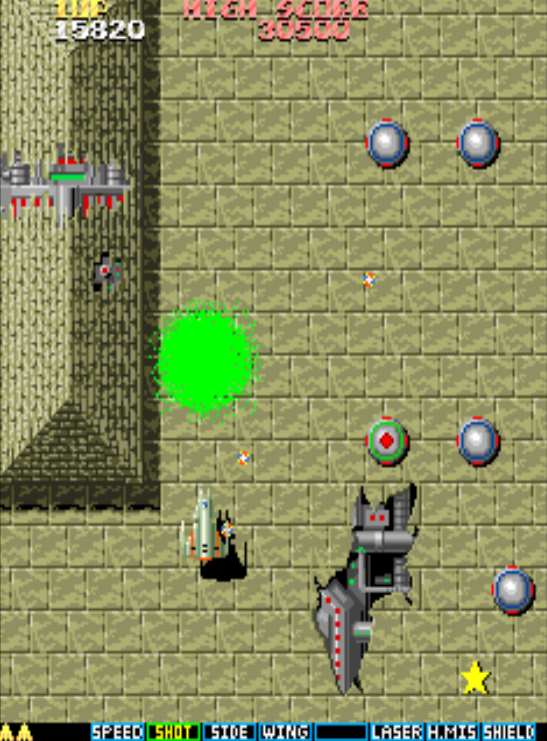 Hence, multiple enemies can be destroyed in lines using Laser. 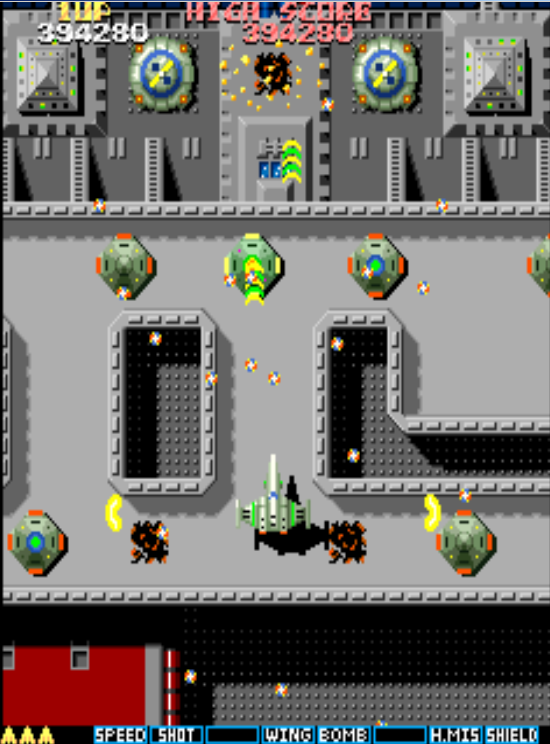 Its principal weakness, is that to get the most out of the weapon (and to ensure it fires the full length of the screen), the player has to press and hold the fire button down. If you let go of the fire button, the lasers on-screen disappear. More than anything else, this is just an adjustment you need to make as a player. Once you get used to it, Laser is a fine weapon. Although Laser benefits from 'pulsing' the fire button. as a player you can of course still hammer the fire button if you want to. However, when you do this, the range of the laser becomes very limited (comparable with the range of 'shot'). The frequency with which you hammer the button, directly affect the range of laser pulse. (Remember the laser disappears as soon as you let go of the fire button and a new one is projected when you hit the button again). It's important to realise that there is nothing inherently wrong with using this technique - especially if you get in close to enemies. In fact, getting in close and hammering the fire button with laser, lays down a greater number of hits and is very useful against bosses. As mentioned, when using Laser, most of the time you will be 'pulsing' the fire button so that you can send the laser beams the full length of the screen. However, one of the consequences of this, is that the effectiveness of the 'Side' weapon is significantly reduced. 'Side' is a 'shot' type weapon that benefits from rapid fire button pressing and so the steady presses for the laser, radically reduce side's impact. Of course, you can at any moment go into a fire-button frenzy and use Side to its maximum potential - but it will be at the expense of Laser's range. I think it is important to mention this only because 'Side' is such a critical weapon in the game. Laser - with 1 Wing. Laser's range make it the most effective weapon for clearing the screen of enemies quickly. Although Bomb covers a decent area and Homing Missiles hunt down all targets, nothing can match the speed in which Laser can wipe out a screenful of enemies. 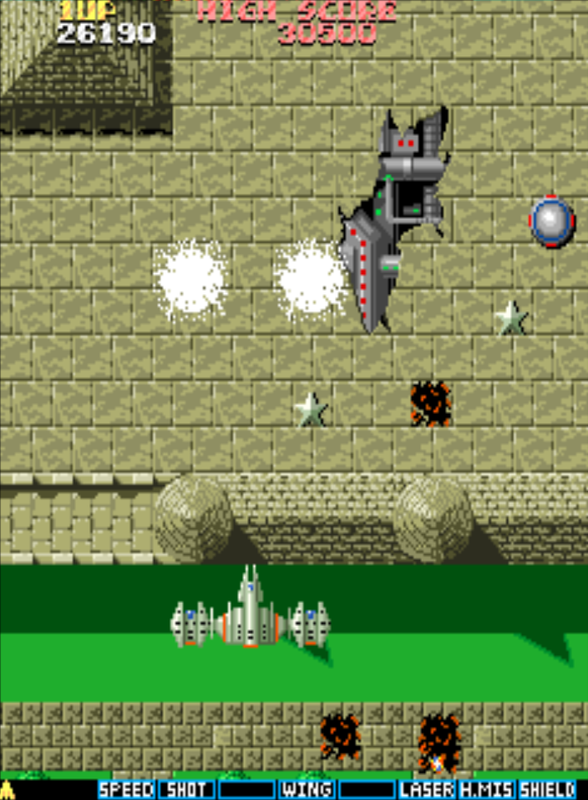 With 'shot' or 'bomb', enemies that appear at the top of the screen are much more difficult to dispatch because you have to physically move your ship towards the top of the screen; but with laser equipped, you can quickly destroy anything that crawls on from the top of the screen and this is the great advantage of this weapon. Doing this enables you destroy many enemies before they have a chance to fire. Not having to venture too far up the screen can be a real bonus too, especially when you are not sure of what is coming up next on the map. It should be noted that although Laser will destroy many targets unhindered, this is not always the case. Targets that require two hits to be destroyed will completely absorb a full laser pulse before dying. Other targets which are tougher (such as those shown in the image above-left) will likewise do the same. In fact you can see in that image that the left-hand laser is being absorbed by the enemy. Although this enemy will still die, the laser itself will not continue onwards up the screen. Homing Missiles are probably the most commonly used weapon. They dispatch large numbers of enemies without the need for accurate aiming that is required by Shot or Bomb (or to a certain extent, Laser too). Homing Missiles are fairly slow though. 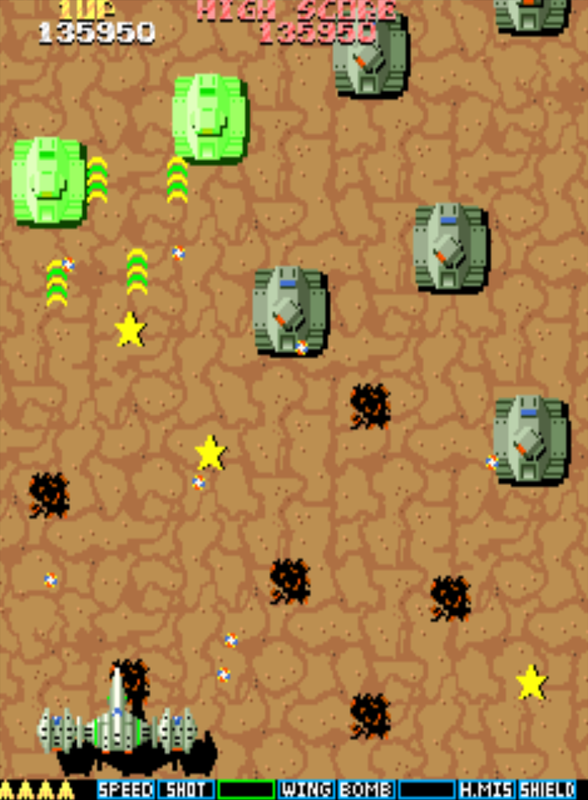 So the main downside is that you must be careful to avoid enemy bullets, whilst waiting for the missiles to strike home. For this reason, having the 'Side' weapon installed is a must when using homing missiles. When equipped, this weapon will only release the minimum number of missiles necessary to destroy the targets that are on-screen at any given time. So this could be just a single missle, or, it may release up to 16 missles. This is irrespective of how many wings you have equipped. 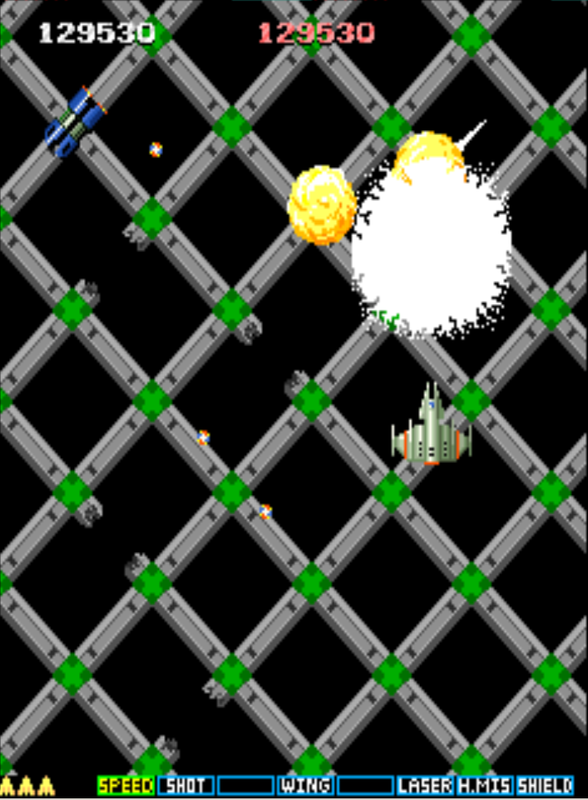 If the screen is empty of enemies and you continue to fire, then the weapon will release all 16 missiles. Interestingly, when going up against any of the bosses, this weapon will only release six missiles at a time, which seems a bit of a cheat! 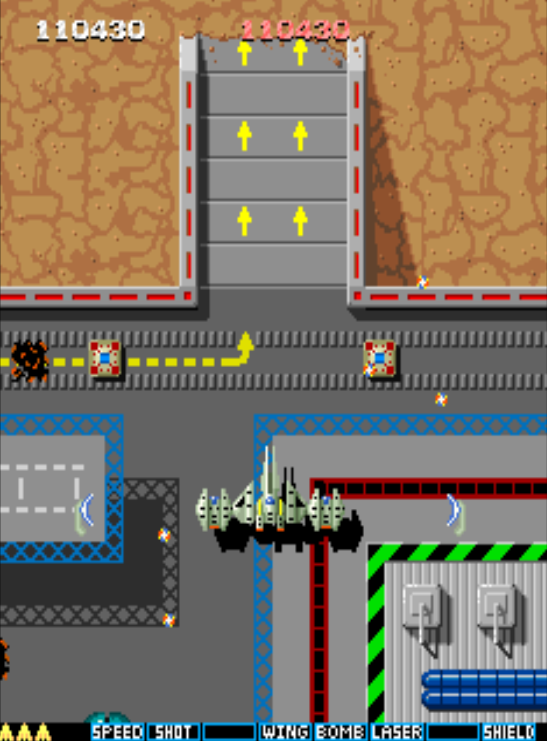 When homing missiles are equiped, the game sometimes provides additional, non-threatening, static targets for them to hit. It's as if the game designers felt the weapon was slightly overpowered and needed to 'use up' some of the ordnance. The more you play the game though, the more you will understand the benefits of the other main weapons, and the various advantages they have. Certainly, for specific sections of the game, other weapons are far superior. If 'shield' is highlighted and other stars are available onscreen, then generally speaking, it's always worth taking the shield, since if you collect another star, the weapon highlight cycles back round to the beginning, and so is effectively wasted. Of course, if you are fully powered up, then having shield highlighted and ready to go can be a very useful thing to have. But you should not get hung up on trying to keep it highlighted. I think there is a couple of reasons for this. Firstly, you will now have to dodge and avoid any other stars that appear onscreen. Secondly, you enter a mindset of 'when is the best moment for me to activate my shield'. This can go on for a long period as you continue to play the game, concentrating on when you are going to use your shield. This mindset is more of a hinderence than a help. You are nearly always far better off just taking the shield immediately and cracking on with the game - collecting more stars and readying yourself for another upgrade/change of weapon. Once you actually select 'shield', the player's ship begins to flash yellow and an audible twinkling sound plays, confirming that the shield is active. The duration and durability of the shield is quite strange and difficult to fully understand. If, after you activate the shield, you do not take any hits, then it remains active for around 25 seconds before finally disappearing. If, after you activate the shield, you take one or two direct hits, the duration of the shield is shortened by some length of time. At the moment you sustain a third direct hit at any point during the shield's lifetime, the shield will be immediately exhausted at that point. It seems like you get diminishing returns (in terms of shield duration) whenever you take a hit to your ship. I notice on Wikipedia, someone has said that the shield lasts around 25 seconds, or three hits, whichever comes first. This is not 100% correct, since if you take a single hit, the shield duration is shortened. If you take two hits immediately after activating the shield (and never take a third) - the shield lasts barely eight seconds. The image that I've put above shows a shield active on a ship with full homing missiles equipped. Note that half of the upgrade options are blanked out, since 'Side', 'Homing Missiles', 'Wing' and 'Shield' have all been applied to their maximum potential. The high score table in Slap Fight is standard in most respects. Ten scores are recorded. Players can enter up to three characters (and thankfully for people like myself with no middle name, blank characters, full stops and hyphens are all available). The players on the table are listed as 'Excellent Players', which is very kind. Also, because Slap Fight does not offer you a chance to 'continue', all scores you see on the table have been acheived with a single credit, which is great to see. As mentioned previously, the table also displays the 'Area' that the player reached during their game. It should be noted that the ranking of players is based upon their score, not how far they got. In the arcades, this was sometimes interesting as you could see that some players had got quite far in the game, but had a relatively small score. This is quite dependent on the weapon that is used during different phases of the game. I quite like the point scoring template that is used in Slap Fight. Scores are sensible and coherent (not millions and millions of points). Ahhh, bosses! You have to love 'em! When all the minions of a game have been dispatched, out comes a big baddie to try and take you down. Usually equpped with some unique weapon, and always BIGGER than a normal enemy, some bosses are pretty easy and some can be fiendieshly difficult. Some are well designed and intelligent and others are disappointing and extremely dumb. Often a specific weapon or method is required to defeat them. I think Taito did an okay job with the bosses in Slap Fight. You have to remember that this game was released in 1986 (and probably designed in '85). During that time, bosses were still fairly basic in games and I think Taito pushed this side of things forward pretty well with the release of Slap Fight. Of course, just over a year later, Irem released R-Type and I think it's fair to say, blew everyone away with their Boss designs. They really did up the ante with that release. Anyhow, with Slap Fight, the bosses come along at varying intervals (they are not evenly spaced) and they work differently to most that you see in arcade games. The main difference is that you do not have to actually destroy some of them, in order to continue on in the game! This is a strange setup indeed but in keeping with Slap Fight's inexorable scrolling methodolgy....the game almost never stops and the background (almost) never pauses. As mentioned in my introduction, the bosses do not signify the end of a discrete 'level' either. For bosses 1 - 3, the game continues scrolling, and whether you destroy the boss or not, the game rumbles onwards. These bosses do their best to stay with you for a certain period of time but after a while, they will disappear off the bottom of the screen. With this in mind, it is entirely possible to get past the first three bosses (such as the first one shown below) without firing a single shot. The potentially tricky aspect (for the player) of this design, is that after a time, because the game is scrolling ever onwards, standard enemies start appearing onscreen again. This means that if you do faff around and leave the boss hanging around, you then have to deal with those enemies, as well as the boss at the same time. Boss 1: The first boss (shown left) arrives at around area 18. He is nice and easy to defeat as his bullets are fired towards you in simple clumps and are pretty slow. In between each firing, there is an appreciable delay, giving you ample time adjust your position. So with this boss, it's a case of moving to one side, waiting for him to fire and then moving back to the middle, so that you can lay down some fire onto him. If you move closer towards him and to the sides, you tend to afford youself more space, as his bullets angle towards to you, leaving a bigger gap to move into afterwards. Be aware that you cannot just move to the side or above him and remain safe, as his bullets do track your position. So you do have to always be ready to move. 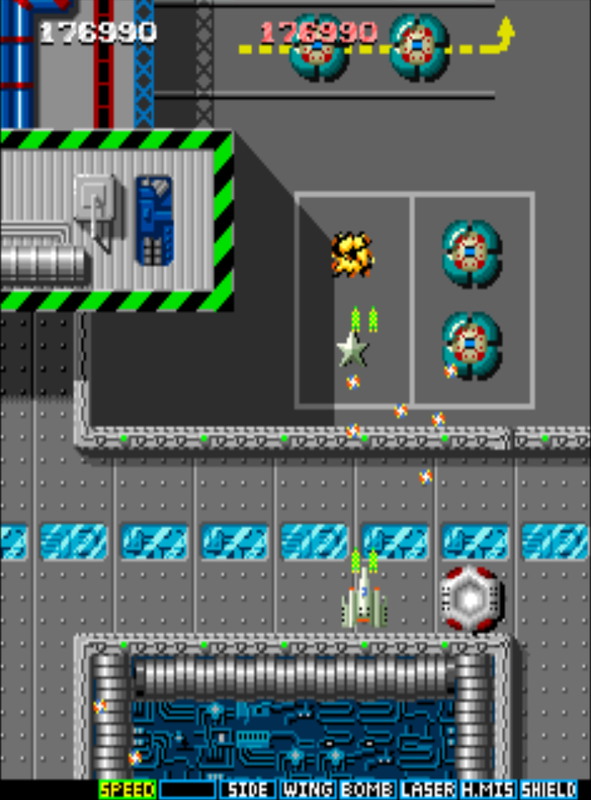 If you are equipped with homing missiles, a good method is to just do circular movements all the way around him. (Remember, it is not possible to crash into him). His bullets are far too slow and will always fall behind you. In games, some enemies fire leading shots - that is they shoot to where you are moving to, this boss does not do that. As already mentioned, you can quite easily not even bother firing a shot against this boss and then just let him trundle on his way off the bottom of the screen (but where's the fun in that?!) In fact, the quicker you destroy him, the more rest you will have before the standard enemies start to appear again. Around 6-8 hits with bomb weapon destroys him (no wings). Around 14 hits with a laser (if performing full length pulses - no wings). 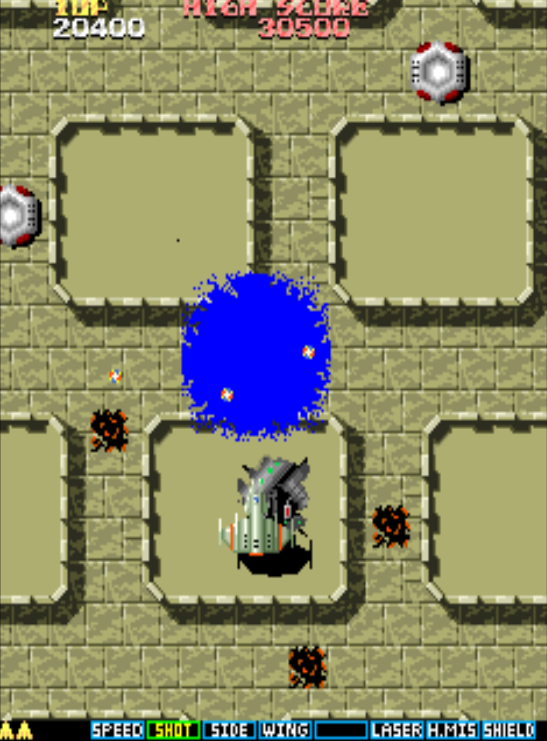 Using full pulses, you may not actually have time to destroy him before he leaves the screen, so in this instance, it is far more effective with laser if you get in fairly close and rapid-fire the laser to hit him multiple times. You will destroy him much more quickly this way. Around 8 separate firings when equipped with homing missiles with zero or one wing applied and 7 hits if you have two wings. (I don't think you can reach tier 4 by the time you reach this boss). Interestingly, when attacking with homing missiles, only six are ever released towards this target (regardless of power). Using 'shot' is fairly hard work, not least because you have to shoot him directly at his front and you have to get in quite close as well. Overall, a nice and easy boss to defeat. Boss 2: The second boss arrives at around area 40 and is made up of three distinct parts. 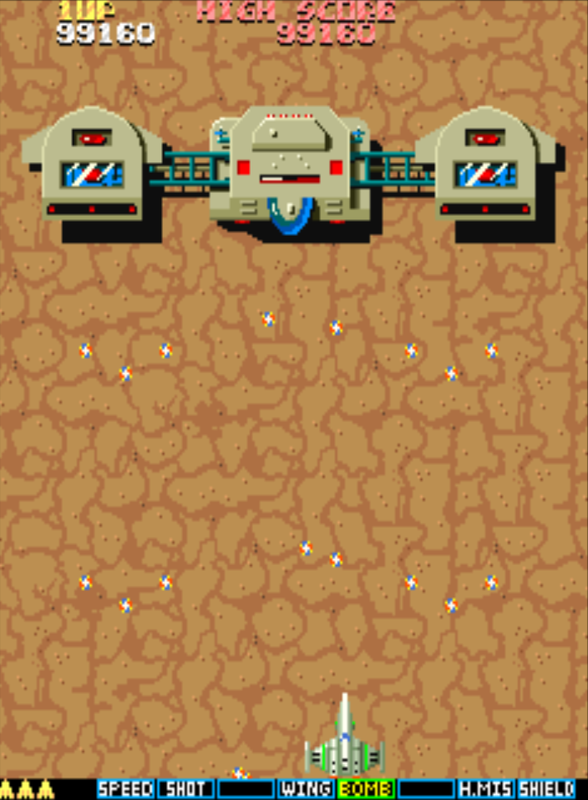 Each part spews out bullets towards the player. It order to defeat this boss, the central portion must be destroyed. This boss is definitely trickier than the first, mainly because his initial bullet spread is pretty wide. If you arrive at this boss and do not initially shoot, you will likely lose any power wings you may currently have, because space is very limited. However, there is space and it's fairly easy (if you remain calm) to move left and right into two pockets of space that alternately appear. Note that you will only fit into this space with a maximum of one wing attached. However, you can make things much easier for yourself if you firstly concentrate on the two side pods. These side pods are very very weak, and so the trick here is to very quickly destroy them when the vehicle is first coming onto the screen. If you are quick, you can take them both out immediately. But at the very least you will be able to take down one of them and this gives you much more manaevoring room. If you have two wings attached and do this, you should be able to retain them. 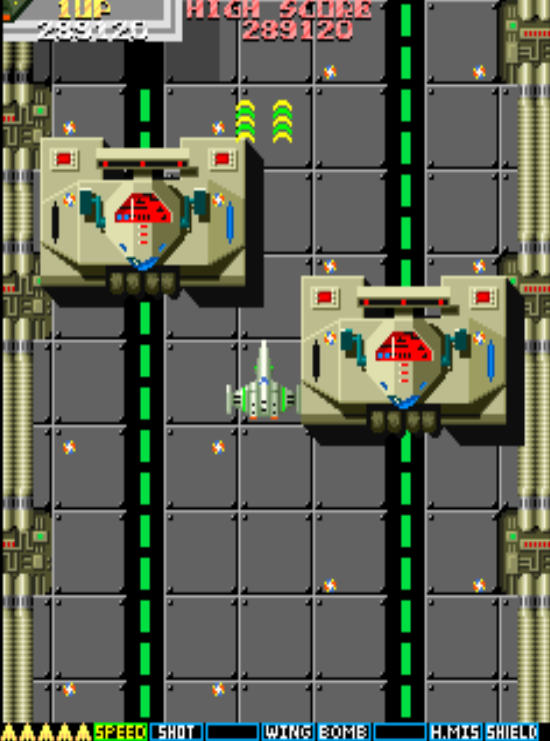 If you are equipped with homing missiles here, then you will indeed need to focus your attention on those two pockets of space at the bottom of the screen. Try and wait until the last moment before moving to the left and then likewise to the right and so on. This makes the space a little bigger. If you move too soon, you will be trapped with nowhwere to go. Calmly keep this up whilst you let your missiles take him out. They will firstly take out the side pods and then the main boss. For any other weapon, head straight near the top of the screen and take down one of the side pods as it first arrives. Once you have taken down one of them, the rest should be fairly easy. You can dive quickly in and out to take out the other side pod and then focus on the centre. Note that you do not actually need to take out the side pods in order to destroy the boss. The whole thing dies if the central pod is destroyed. But because the side pods are so weak, it just makes life much easier if you destroy them first. Remember, you cannot physically crash into this boss, so you can fly anywhere over the pods if you want (be careful of bullets though). 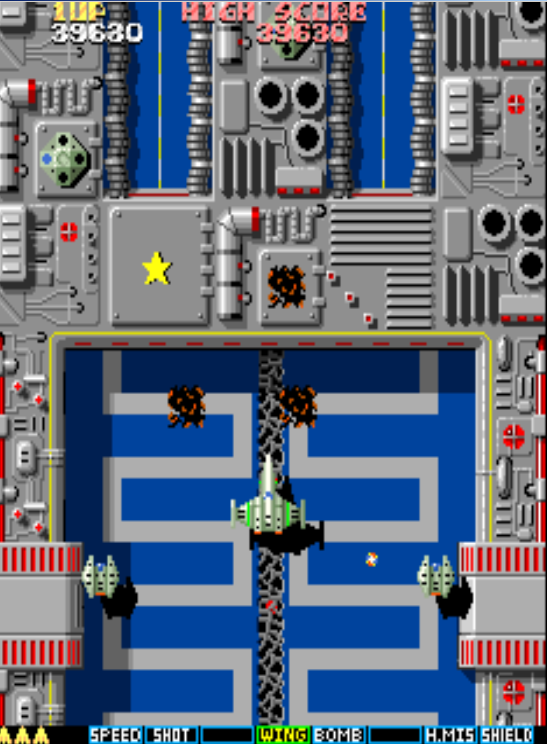 As a side note, when I used to play this in the arcades, I used to think that the horizontal bar shape on the central section was some sort of indicator as to the boss's health. But having played this on an emulator since, this is clearly not the case! Boss 3: This boss arrives at around area 68. The first couple of times you arrive here, you may think that this is pretty damned difficult. But it's really not that hard and certainly not as difficult as the final boss. As you approach this boss, be ready to immediately lay down fire onto the glass structure (the game actually stops scrolling here). Pummel him as much as you can and retreat backwards if you have to. If you cannot destroy him before imminent death, then you must be ready to switch weapons or apply a wing. This should give you enough time to lay down additional fire and destroy him. Once destroyed, he slides rapidly upwards and disappears out of sight. - Presumably to reappear again later (boss 5 looks the same). From practice, I would say that Laser is the most effective weapon here. You can often destroy him without the need to swap wings. Note that if you do not have another weapon or wing ready to go (as in the example on the left), when you head in to shoot him, immediately take out some (or all) of the static enemies that flank him. Significantly, each one drops a star. Besides this, these six enemies fire bullets across the face of the glass and prevent you from parking yourself right on top of him. (You cannot crash into him). So taking them out immediately means that you can get right on top of him and increase your strike rate..
Boss 4: This is a bit of a strange one I think. This boss feels like it should actually be boss 3, since it is far easier to tackle. Anyhow, at this point (roughly around area 72), two separate bosses appear. First the left hand boss appears and then fairly quickly afterwards, the second right-hand boss appears. They can each only move on the vertical plane, because they are both fixed to rails that are marked on the screen as dotted lines. Each one can fire only directly forwards and directly backwards. These bosses are very easy to defeat. Firstly, it is possible to take out the first boss before the second one even appears. 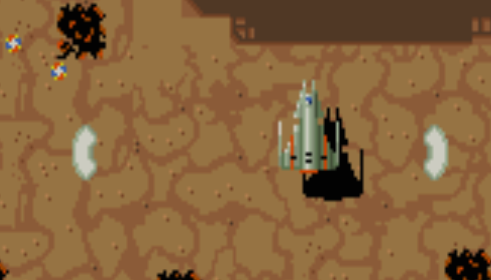 If you don't manage that, the player's ship even fits in a good sized gap between the two enemy vehicles. (See image on right). 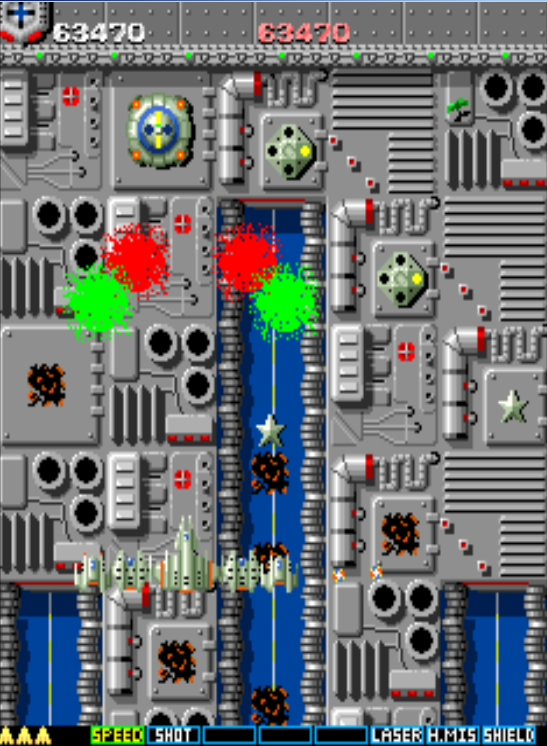 Note that only a ship equipped with a maximum of one wing can fit inbetween the two bosses. If you have additional wings, they will be taken out by the bullets that are fired. 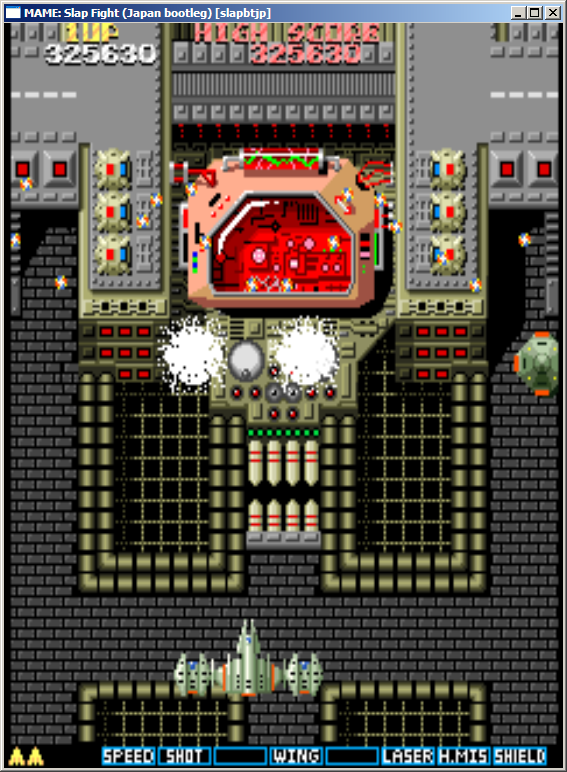 However, once you are in between the two bosses, the player's ship is invulnerable. If you are equipped with the 'side' weapon, you can shoot both ships with impunity. Interestingly, if you have no wings at all, you can even squeeze your ship into a space down the extreme left or right-hand side of the screen - and you will not be hit (although you will still need 'side' to actually shoot the vehicle). These bosses do not shoot directly above themselves from the middle of the vehicle. They only do this from below. So this means that you can position your ship directly above them (in the middle) and you cannot be hit. More usefully still, this means that you can sit directly on top of them and shoot them with impunity. (As usual, you cannot crash into these bosses). You just need to be a bit careful that your ship does not stray too far down below the front of the boss, if so, he will shoot you. Interestingly, although the left-boss arrives first, the track that the right-boss follows is longer and so he hangs around for longer on the screen. Boss 5: This is the final boss. For the second and final time, Slap Fight comes to a halt here. Perhaps it's boss number 3 making a re-appearance. Perhaps not. Either way, the glass structure looks exactly the same, except this time there is quite a bit more firepower directed against you. Having said that, unlike with boss 3, there are no standard enemies moving around which makes the pattern a bit less random. This chap arrives at around area 80 and needs to be tackled in a similar manner to boss 3. That is, get up high - right to the top of the screen and unleash hell as soon as possible. You should be doing this before he has even started to appear on the screen. (Knowing when he will appear, obviously only comes with experience). When he does then appear, position your ship right on top of him and be sure everything you are unleashing is going into him (main weapon and 'side'). You will only get a brief time to do this before the bullets rain in. 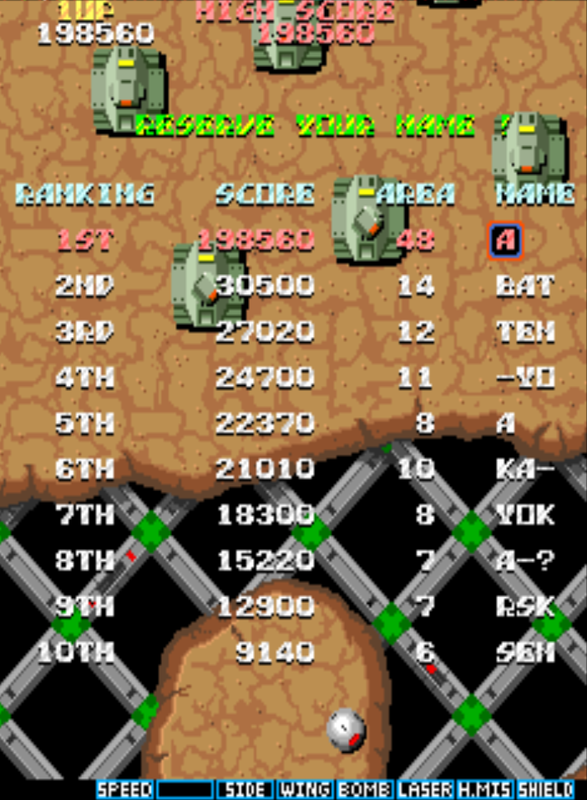 As soon as that happens, immediately pull down to the bottom of the screen and retreat (keep firing). If all goes well, you will either destroy him before or during this downwards movement. Otherwise you will have to dodge at least one flurry of fire. The glass structure itself doesn't even fire anything. The bullets all come from the various emplacements positioned around the screen. Having 'side' equipped (which you should have) is fairly critical here because you can sit right on top of the glass and pummel away for several seconds until he starts firing. (With your side weapon hitting from both sides of your ship). Remember, if you do not manage to destroy him before the bullets come, try and perform one circular dodge and the come straight back up for another hit. That should be enough to end him. Try not to get caught up in a long-winded dodge fest, because you will likely die. Although there are quite a few bullets on the screen, it is perfectly possible to dodge at least a few times. Some of the bullets are trickily positioned and will likely catch you out eventually but nearly all players have at least one dodge in them! Remember, if you do think you are going to die, change weapons or apply a wing if you can. This can make the all the difference. After defeating this boss, the game starts back to a similar beginning. There is a very brief interlude as you fly through a short foresty area, and then you arrive at 'the wall' and start back at the beginning of the map. 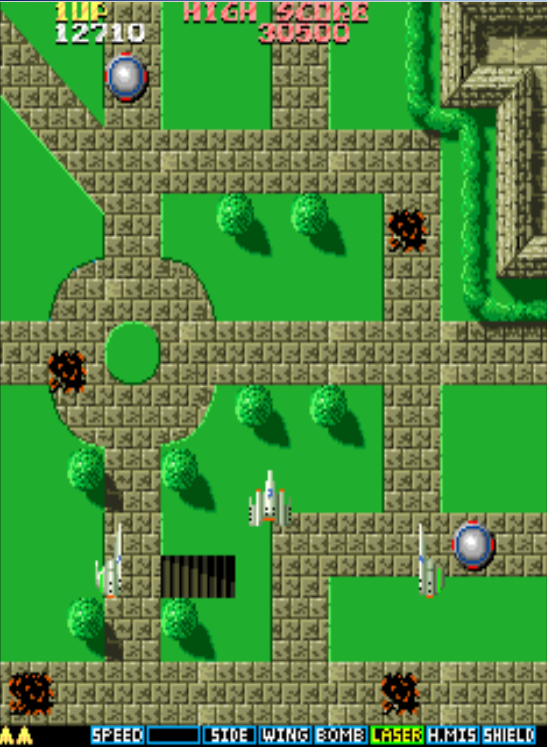 From here on in, the background map is the same as before, but the enemies are now more numerous, move in different formations and fire significantly more quickly. You could argue that when you destroy this boss, you have successfully completed the game (or at least gained a moral victory over the computer!) - because as far as I know, the game just loops continuously. 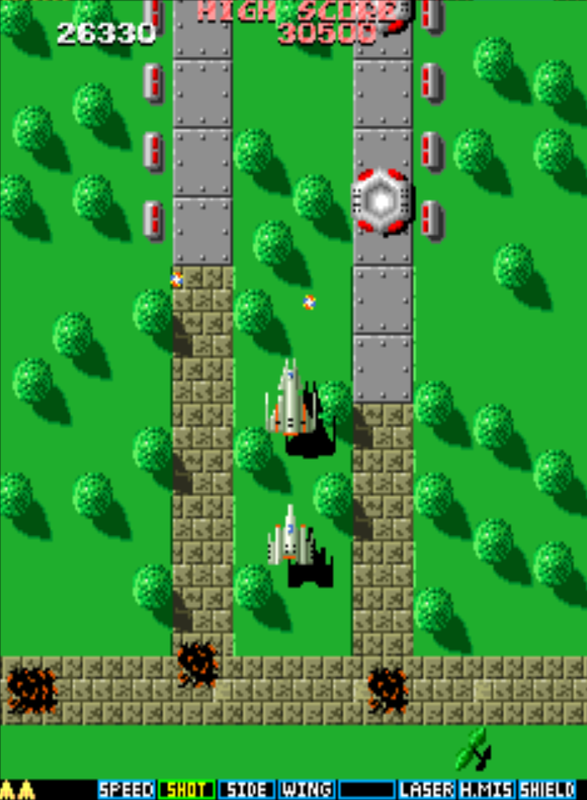 When you start the game, if you do not score any points and then get killed, (you may still move around and fire you weapon), when you begin again with your next life, it will be equipped with homing missiles and maximum wing power ups. However, you will still have no speed ups, so quickly get those. You will also be given (gasp!) - a 1,000 point bonus! This cheat was well known to most of us players back in the 80's, but none of us ever used it because of course the trade-off is that it costs one life and this is far too high a price to pay. It is easy to upgrade your ship to full spec from the beginning of the game. An extension of this cheat also exists (which no-one I knew during 1980's was aware of - myself included.) Again, it involves not scoring any points at the start of the game and avoiding all enemy fire. 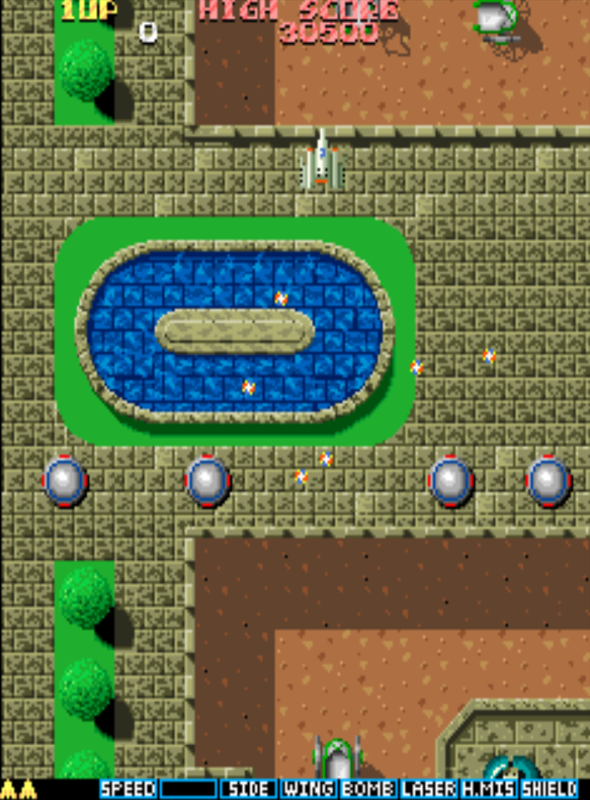 But if you manage to get all the way past the oval 'pond' (shown on the right) before dying, then when you appear with your next life, again you will begin with homing missiles and full wings, but this time you will be given a 150,000 score bonus and boosted all the way to area 30 (which is shortly before the 2nd boss). This area boost is quite significant and is tempting to try out. Though of course if you die anywhere below where the ship is shown on the right, you will be begin right back at the beginning of the game on your next life and receive no such area boost. I have tried staying alive for as long as possible and have noticed that the bonus can be increased (though the area boost seems to stay the same). I have managed a 180,000 bonus so far. Note that these cheats only work when used on your very first life. Much like the great game, 'Nemesis', (aka 'Gradius') it is possible to pick up too many speed ups for comfort. Five is the maximum number of speed boosts allowed in Slap Fight, but many people would find the ship pretty hard to control at this level of speed. If you have any upgrade option highlighted on the menu and you then die, the game provides your next life with one 'free' star (as if already collected). Regardless of how many wings you have equipped, if an enemy bullet strikes your main ship (in the middle) you will die. This game is an old school shoot 'em up and as such, does not allow you to 'continue' ! Therefore, unskilled players cannot just pump dozens of credits into the machine and complete the game. This also lends the high score table a lot more credence. It is possible to 'lose' power wings 3 & 2 (by being hit), whilst still remaining alive - but you cannot lose power wing 1 without completely destroying your ship. When all your lives are lost, if you are in the top 10 of players, the high score table is displayed over the top of the game area. With the table displayed, the background game area continues to scroll, complete with all enemies and their formations etc. (this game just loves to scroll!) - however, because the player is absent, they do not fire. This conveys something of interest to the player, since it is possible to see 'further up the map' and potentially gain an insight into what types of enemies and their movements are in store for the player, later on in the game. What I find very interesting is that the game allows you around 27 seconds to enter your initials, should you find yourself between 4th and 10th on the high score table. However, if your score is in the top three, it allows you around 55 seconds! At the very least, this is interesting - but In practical terms it can also be quite useful! Potentially for nearly a minute, it is possible to see further up the map and check out what you will have to tackle next. Back in the 1980's, I used this many times myself (though of course it's only really of use if you have reached a point in the game which is at least as far as you have got before). I was not aware of the high score timing differences though. I do love quirks like that! (Only discovered since testing on an emulator). Try and plan it so that you have either a 'wing' or another weapon ready to go as you approach a boss. Then you can apply the wing immediately after the boss is destroyed; or, you can apply mid-battle and make use of the invulnerability period, which may just make the difference between life and death. Slap Fight is a single player game only. Two players can play, but it's old school and they take it turns when a life is lost. During this period, most games were like this. A few years later, towards the end of the 1980's, the majority of games started to become dual-player. (Vapor Trail, Prehistoric Isle, UN Squadran to name a few). As mentioned in my introduction, the player's ship cannot be destroyed by hitting an enemy directly (even bosses), nor can it crash into any background object. In the Slap Fight demos, (which serve to attract players to the game) the onscreen 'player' never dies. This is very rare! Some enemies (especially static, non-threatening targets) are only destroyable with certain particular weapons. Furthermore, some non-threatening enemies only present themselves when a specific weapon is being used (eg, homing missiles attract special non-threatening targets that swing round). These do nothing more than 'use up' homing missiles. Different weapons destroy different, unique areas of the game-play field. Eg, the 'bomb' weapon sometimes destroys some of the background, revealing interior parts etc. Because the game scrolls at a fixed rate, the music that plays in the background becomes can be very useful in learning when certain enemies are about to appear. Stars are always dropped by the same enemies, so you can learn which ones to target when you're in need of an upgrade. Occassionally, small trees can be made to grow with either the bomb or laser weapon, giving you a points bonus. The more you hit the tree(s), the more they grow and the more points you score. There you have it. 'Slap Fight', a top quality arcade game from a bygone era. I'd like to extend my great thanks to all of the original team at Taito (whomever you may be) and also all the original developers, designers and programmers who worked at the Toaplan company for creating such a brilliant game. I really hope you enjoyed my thoughts on this game, but if you do know of any errors or inaccuracies, (or indeed of some titbits that I've missed), then please let me know!